The Philadelphia Flyers played their final 34 games of the 2015-16 season (including six postseason contests) without defenseman Michael Del Zotto due to a wrist injury that required surgery. Over that time the team made a surprising leap into the playoffs, finished in the first Eastern Conference wild card spot and then won two games against the Presidents Trophy winners, the Washington Capitals. Because of that success, it’s become easy to forget how much of an impact Del Zotto made on the Flyers’ roster. Impacts such as his team-leading 23:24 minutes of average ice time a night, ability to play both the penalty kill and power play plus his puck-moving prowess made him the team’s number one defenseman even after Shayne Gostisbehere joined the team. Philadelphia took a step forward last season and it plans to do so again this year. With an evolving defense, Del Zotto will be crucial to the Flyers’ growth this season. When Del Zotto signed with the Flyers in August of 2014, he came as a player with trepidation surrounding him. He had a great first three years with the Rangers compiling 89 points in 204 games and looked like a solid second-pairing offensive defenseman for years to come. But in 2012-13 he hit a wall, recording just 21 points while dealing with injuries. But worse was that mistakes became too prevalent in his game, which is a trait that follows offensive defenseman. While Del Zotto could help create offense, he wasn’t strong enough defensively to handle a ton of minutes. 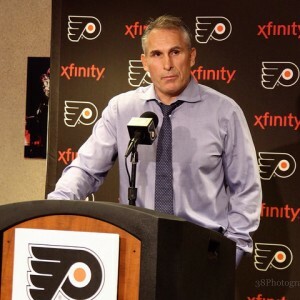 Craig Berube was instrumental in Del Zotto’s improvement (Amy Irvin / The Hockey Writers). The next season was even worse. Del Zotto’s point production cut in half despite playing under new coach Alain Vigneault instead of the defensive-heavy John Tortorella. By January, New York was done with the Ontario native, shipping him to Nashville for Kevin Klein. The Predators didn’t see much worth in him either, choosing to not qualify him as a restricted free agent and letting Del Zotto walk. But that setback opened up the doors for Philly who signed him after Kimmo Timonen’s announcement of blood clots that caused him to miss most of the season. Del Zotto began the 2014-15 season on his third team in less than a calendar year, but on a team that actually wanted him. At first, it was slow sailing. Coach Craig Berube gave Del Zotto more free-reign, but mistakes happened and Berube wasn’t afraid to sit him on occasion. However, those benchings didn’t happen as often as in New York or Nashville and Del Zotto grew more confident as his playing time wasn’t cut for trying to make plays. The then-25-year-old finished the season with 32 points, his highest total since 2011-12 and was rewarded with a two-year contract extension. The evolution process for Del Zotto wasn’t done, though. Although Berube had success with Del Zotto, he struggled in other facets of coaching and was fired following the 2014-15 season. 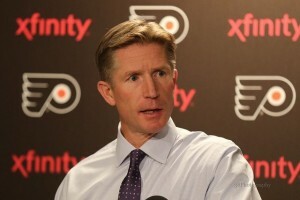 In his place, the Flyers hired Dave Hakstol. Dave Hakstol morphed Del Zotto’s game into a more defensive one (Amy Irvin / The Hockey Writers). Instead of showcasing an offense-exclusive game, Hakstol had Del Zotto take more of a defensive focus on his game. In return, the defenseman was given more ice time and more responsibility, while his game molded into a more-complete one. On the flip side, Del Zotto’s point totals took a serious hit. The 32 points from 2014 were cut in more than half to just 13. However, he played in 12 fewer games and Gostisbehere deservedly took a large portion of his power-play time. And that trend may not buck this season. More young players could be eating up time on the Flyers’ back end but that doesn’t spell the end for Del Zotto…yet. The Flyers hope that Gostisbehere is just the beginning of a long line of defensemen grown through the team’s pipeline. If everything works perfectly (spoiler alert: it won’t) Philly could have as many as six prospects join the team on the blue line over the next three to four years. Starting with next season, Ivan Provorov stands a good chance at making the team out of training camp. Samuel Morin, Travis Sanheim and maybe even Robert Hagg could warrant NHL time as the season progresses. But those defensemen won’t be able to handle the defensive load that Del Zotto can. Those duties will be left to him and over other players like Nick Schultz, Brandon Manning and Andrew MacDonald. A full season of Gostisbehere and Del Zotto should help the team’s offense (Amy Irvin / The Hockey Writers). Plus Del Zotto can be an experienced leader for the team. It’s likely that a player that’s been through the ups and the deep, deep downs can help a youngster get through ruts and improve. But his most valuable asset will be his ability to move the puck. The Penguins proved last season that speed can be deadly, but not just in foot speed. How fast a defenseman can get the puck to his forwards will likely be a skill that will be closely monitored moving forward. Del Zotto’s strength is exactly that and he can act like a Trevor Daley to the Flyers’ defense. Daley was brought in to ease the offensive load on Kris Letang in Pittsburgh. Del Zotto will be able to do that for Gostisbehere this upcoming year. But if Gostisbehere begins to welcome his fellow youngsters this season, 2016-17 could be the last for Del Zotto in the orange and black. His contract expires in June and with a slew of prospects waiting, a $5 million-or-more contract may be too rich for the Flyers. And Del Zotto will be looking for a contract in that range. After all, he’s proved how valuable he can be to a team like the Flyers.